Publisher: Mills & Boon Ltd. 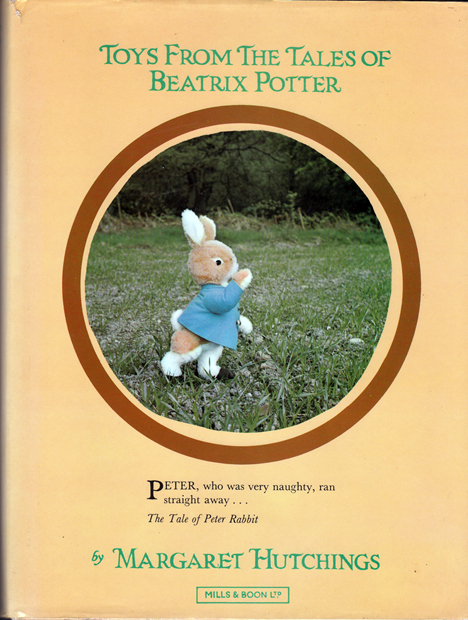 Description: "Full working instructions and same-size patterns are given for some of Beatrix Potter's most-loved characters: a very prickly Mrs. Tiggy-winkle; Peter Rabbit in his new blue jacket with the brass buttons; Squirrel Nutkin with half a tail; the silly goose, Jemima Puddle-duck; Mr. Jeremy Fisher; that terribly tidy particular little mouse, Mrs. Tittlemouse, and a whole array of endearing Flopsy Bunnies, rats, cats, pigs and mice. The reader is constantly referred to the original little books, and such is [the author's] ability at putting across complicated toy-making processes, that even beginners could confidently embark on their toys. And that is not all. There are sections on baskets, furniture and other accessories, all beautifully made and to scale, that should make it something more than 'just another toy book'." Glazed pictorial boards repeat jacket design; light wear and soiling to front – not a problem if the jacket is not removed! Minor scuffing to board and jacket extremities, but spine and corners appear straight. Unclipped (£5·50 net) jacket has a negligible closed tear near the head of the spine (refer to image), but is otherwise complete, and in very good condition. Internally, the book is as new. The tightly bound, snow white pages are free from all defect. Measures 24.5 cm × 18.5 cm (9.8″ × 7.4″). Oversize 8vo. 315 pp.